ESCO's employees gathered around to celebrate and have a meaningful time together. we looked at the footsteps of the company and ESCO members that have been walking for the past 20 years. We shared the vision for the next 20 years and proclaimed the "ESCO Spirit" that will bind us together. Besides, we selected the first "ESCO Man" through inside-vote, awarded a prize, and celebrated him. Also, we celebrated our first "ESCO Gold Member". After recalling the identity of ESCO with crystal remembrance, we enjoyed dinner together. 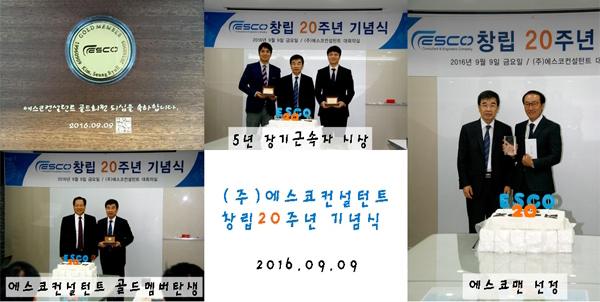 Congratulations on ESCO's 20th anniversary!